It is not very likely that specialists are going to stop releasing potentially unwanted software soon. Specialists still detect it quite often. 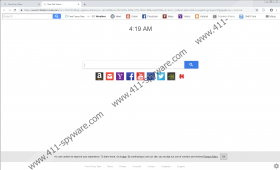 Free Forms Now is one of those potentially unwanted applications specialists working at 411-spyware.com have come across recently. It may be installed on users’ computers without their knowledge, but some users download and install it on their computers consciously too. Free Forms Now can be downloaded from https://freeformsnow.com/ by Internet Explorer and Mozilla Firefox users, whereas Google Chrome users can get it directly from the Chrome Web Store (https://chrome.google.com/webstore/detail/free-form-now/lpdmnkfdkmmpgohfmgmpapjmhffgglpg). We cannot blame users for installing this piece of software on their computers because Free Forms Now is presented as a useful piece of software that enables users to “search and access popular forms quick links instantly.” Without a doubt, you could access them quickly without the help of Free Forms Now too, so think twice before you install this program on your computer. In case you do not know that yet, it also changes web browsers’ settings upon the entrance. To be more specific, you will find a new homepage and New Tab page set after you install Free Forms Now on your computer. If you do not like this idea at all, you should not even think about installing this program. If it is too late to give you advice, i.e. you have already installed Free Forms Now on your system, eliminate it right away. Everything will get back to normal the second you erase it. Free Forms Now changes browsers’ settings once installed on the system, so even if it enters your system secretly, its entrance will not go unnoticed. You will find your homepage and New Tab page altered. The page Free Forms Now sets on users’ web browsers looks like any ordinary search provider. It has a toolbar with quick-access buttons that open government forms and other popular websites at the very top. Additionally, it contains a search box that returns Yahoo search results. This search tool is considered reliable, but since all users’ search results are redirected through search.hfreeformsnow.com first, there is a possibility that users will see some modified search results too, specialists say. The main problem with them is that they might redirect to untrustworthy websites once clicked on. Without a doubt, this is not the case with all the modified search results users are provided with. We cannot confirm that the search tool promoted by Free Forms Now is better than ordinary search providers, e.g. Google, so you should not keep this potentially unwanted program installed just because the promoted page looks useful and reliable. You could set a new search tool you like after the full Free Forms Now removal. You will also make sure it no longer collects information about you if you remove it from your system. Luckily, potentially unwanted programs like this one focus on the collection of non-personally identifiable information, including Internet Protocol address, geographic location, the type of browser, and some other details. We are sure some users download and install Free Forms Now from its official sources, but, of course, there are people who cannot explain how this program has been installed on their computers too, which suggests that it might be distributed using alternative distribution methods. Research conducted by experienced specialists has clearly shown that Free Forms Now might be spread bundled. Also, users might be presented with malicious ads promoting it. Finally, it might come as a redirect. In other words, you might be presented with an offer to install it out of the blue while surfing the Internet. If you cannot get rid of advertisements promoting third-party software, it would be a smart move to check all installed programs – your system might be infected with an ad-supported program (adware). If it turns out to be true, delete it immediately. We do not think that it is the smartest idea to keep Free Forms Now active on the system as well. If your final decision is to remove Free Forms Now completely, use instructions provided below. It will take some time to remove this program manually, but you will not need any special tools to get rid of it. Alternatively, you can use an automated antimalware tool if you want to get the system cleaned for you automatically. Open the browser’s menu (tap Alt+F). Click Remove next to it. Select Free Forms Now and then click the Uninstall button.